Lotta Dress - Compagnie M.
Remember the Louisa Dress I made and declared as my favourite little girls' pattern ever? Well, there's a close contender and it's another Compagnie M. pattern...the Lotta Dress. My friend's little girl recently turned one, so I decided it was high time I used this bold Amy Butler fabric I've had in my stash for years. My favourite thing about the Lotta Dress pattern definitely has to be the contrast collar and pockets, as well as all the different variations you can play around with (three back closures, three pocket options and the chance to add longer sleeves). I only had a fat quarter of fabric, so I had to think hard about the placement of such a large-scale pattern. At the risk of sounding big-headed, I really feel I've outdone myself in that department! My inner perfectionist is ecstatic that everything's so symmetrical. Due to my lack of fabric though, I did end up with the back pattern slightly off-centre, but I matched it up perfectly to make up for it. Can I get a 'whoop whoop' for my chevron stripe matching on the lining please? 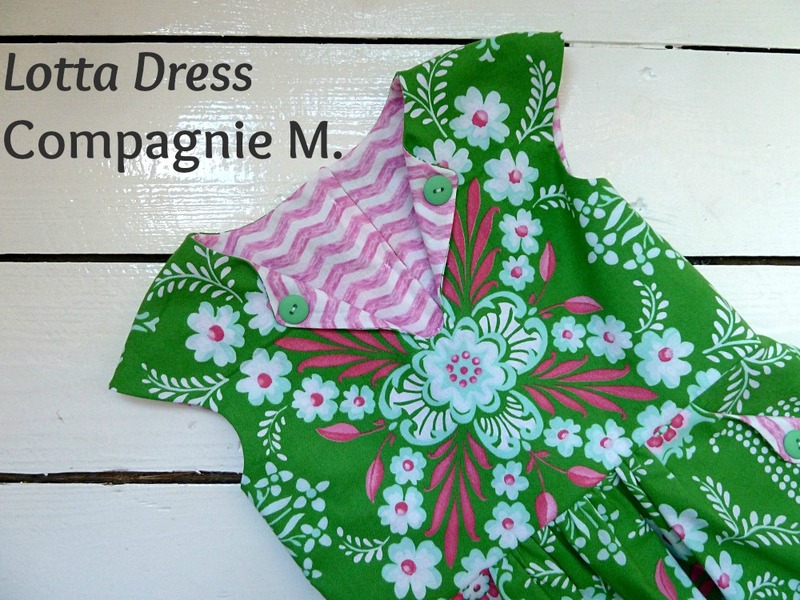 You can find out a little bit more about Compagnie M. patterns and how I found using one here. The only thing I'm disappointed about is investing in the paper patterns. I thought this would eliminate tracing and save me a shed load of time, but I was wrong. The paper pattern comes on one sheet with overlapped pieces, just like the PDF. It also doesn't include instructions, as you get online access to them when you place an order. Needles to say I was pretty annoyed to have spent unnecessary money - the paper pattern provided nothing the PDF didn't already. But it's down to personal preference I guess and all griping aside, I absolutely adore Compagnie M.'s children's patterns. They're the perfect mix of contemporary and retro for my liking, and make such thoughtful and memorable gifts for little ones! What do you think to Compagnie M. patterns? Cute dress! Love the fabric and you placed it wonderfully! Woop-woop this is perfection. Well done its totally awesome. Oooooh, lucky me! Thank you! I already said so on IG. but standing ovation for your print placement. Josh's brother is just about to have a baby girl, so I'm looking forward to some cute mini-sewing soon. Thanks for the standing ovation :o) Can't wait to see your mini-sewing soon...there are so many great patterns for little girls out there! Cute pretty dress! Just today I saw a pair of green shoes perfect for this little dress! So gorgeous!!! You have a great eye for prints. Thank you! I do love picking out prints...it's such fun! Wow, Marie. This is stunning! I adore those colours and the placement is impeccable!! Thank you Janene, you're too kind! Wonderful way to use this fabric! Uaoaoaoao! Ti meriti decisamente un applauso! Never apologise for writing to me in Italian...I love your language and culture :o) Also, thank you so much for the kind words...it's thank to you in the first place that I discovered Compagnie M. patterns! What a sweet little dress! I love the materials you chose. Thanks Kat! I bet Imogen would look super cute in something similar! So cute and love the pattern placements too! My daughter would adore this pattern! What a cute dress! I've made the Lotta Dress twice and used the skirt pieces for a skirt too. Love this pattern for little girls. It really is a fab pattern, I can see why you'd keep using it! This is adorable! I love that the bodice is completely lined. Great work on that print placement and the adorable button details! Your pattern matching on the back is INCREDIBLE. Love the colors on this - it's so adorable! Thanks Meg, I'm so pleased with it!! !